The liver is also considered a gland because among its many functions, it makes and secretes bile. 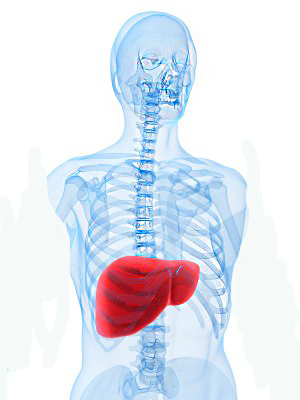 The liver is located in the upper right portion of the abdomen protected by the rib cage. It has two main lobes that are made up of tiny lobules. The liver cells have two different sources of blood supply. The hepatic artery supplies oxygen rich blood that is pumped from the heart, while the portal vein supplies nutrients from the intestine and the spleen. metabolizating medications into their active ingredient in the body. What diseases affect the liver? The most common liver diseases are various types of acute hepatitis, chronic (long duration) hepatitis, fatty liver, cirrhosis , and cancer. Cancers that affect the liver are most commonly metastatic cancers that have spread via the bloodstream to the liver from other sites in the body. However, primary cancers (cancers that arise in the liver) can also occur. The most common type of primary liver cancers are known as hepatocellular carcinomas. Viruses, drugs, and alcohol, as well as metabolic, immune system, and genetic abnormalities are the common causes of many liver diseases. But note that, contrary to a popular misconception, alcohol is only one of the many causes of liver disease. Moreover, sometimes the cause of the liver disease is not known. How do liver diseases cause symptoms? What else is important about the liver? There's one other interesting point about this remarkable organ. The liver has an extraordinary capacity to regenerate (reproduce itself). For example, damage the liver, and it will soon regenerate in an attempt to restore its functions. Cut out a part of the liver, and it likewise will grow back (regenerate) rapidly. In fact, when a person donates a part of her or his liver for transplantation, much of the part that is removed will soon grow back.